Since signing up with their Platinum B.E.S.T managed service package and we could not be happier with the service and friendly attitude of their employees, headed by Jason at the Botany branch. Grassman has been a customer of Computer Troubleshooters for over 2 years now and we cannot praise them enough for the quality of B.E.S.T. (Business Enhanced Support Technology) services they have delivered in that time…They have always been available to support all of our offices in NSW, VIC and QLD and all the staff that we have dealt with have been knowledgeable and professional at all times but most importantly available at the drop of a hat. Not long ago our practice was in need of an urgent medical software upgrade Oasis. Jason was quick to respond to this matter in a professional manner. I have no hesitation to request Computer Troubleshooter’s services in future if need arises or to recommend them to others who may have computer trouble. I was that impressed with their service on the installation that I decided to get their B.E.S.T. Platinum Support Package. Like I said before, I previously would have baulked at paying for such services and try to fix it myself and save money. However after a year on their platinum package it has been one of my best investments. Not only do I have any issues resolved, I can ask the CTS team for advice on any IT issues like software or hardware purchases. I have always found CTS to be friendly, reliable, effective and affordable service provider. I have a network which they effectively established. 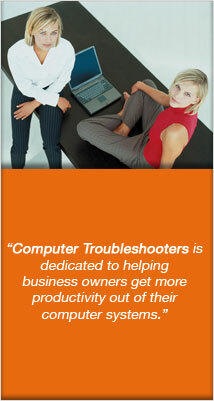 They have secured my system and allowed internal and external back up of my confidential business documents. I have no hesitation in recommending them for any small business.